All politicians, even those in non-democratic states, have to participate on a regular basis in some strange photo opportunities. With the Prime Minister is Mr. Tetsuya Takashima of Himeiji, Hyogo Prefecture. Mr. Takashima won both the 11 Ton Division and the Overall Title in the 44th annual National Truck Driver Contest. He and the Prime Minister are holding the Prime Minister's Cup, one of many, many such awards bearing the Prime Minister's imprimatur. Not all Prime Minister's Awards are backed up with a trip to the Prime Minister's Residence to meet with the prime minister -- who, in a linguistic tussle, never resides in the Residence. This particular prime minister, who officially hails from Yamaguchi Prefecture, does not even reside in the Prime Minister's Residential Quarters, preferring to live in his actual home in his actual hometown of Tokyo -- prompting the ineffectually puckish Democratic Party of Japan to ask for an official government determination on whether or not the prime minister is too afraid of ghosts to live in the supposedly haunted Residential Quarters, a jibe that has played well internationally (Link) but has failed to hit home in the domestic media. Returning to the subject of truck driving, it is one of the few tests of skill graced with an actual Prime Ministerial photo op. However, this has not been the case for most of the contest's history. It was only during the premiership of Koizumi Jun'ichiro that a Prime Minister's Award winner in truck driving actually received his award from the hands of a prime minister. According to the conventional wisdom, the trucking industry has been a vital constituency for the Liberal Democratic Party, supposedly pushing the LDP in the direction (there was not much resistance) of overenthusiasm for costly and under-used high-speed toll roads. It is also a part of the conventional wisdom that Ozawa Ichiro's desire to capture the trucking industry's votes led to the DPJ to promise it would eliminate tolls on the toll roads, despite the ruinous effect such an abolition would have had on government finances and the credibility of government pledges to reduce carbon emissions. The promises to eliminate highway tolls in order to "buy" the trucking industry vote became a big fat target for the LDP to shoot at after the LDP was dumped into the opposition. The promised reductions, which the public knew were dubious, were never carried out, serving in the end only as examples of the DPJ's tendency to promise more than it could deliver. Despite the importance of trucking votes in Japanese politics it took 33 years of Prime Minister's Awards before the contest winners were let into the Residence. Part of the reason may be the contest's unusual pedigree. The sponsor of the first two contests was The Science Museum (Kagaku gijutsukan -- I am sorry but that is the organization's actual English name), presumably as a means of promoting truck technology. After two years under the control of the national museum, sponsorship of the contest was taken over, and I am not making this up, by the Yomiuriland amusement park. There is a story there that I have no time to look into. Interestingly, the year after the contest winners were first received at the Residence, the government privatized the Central Training Academy for Safe Driving. Coincidental? Hmmm...having some contest winners meet the PM for a few minutes for a photo op at the Residence hardly seems compensatory for being thrust into the cold world of the private sector. Why look into all of this, aside from the inadvertent deadpan hilarity of the title of the event on May 30? The National Truck Driver Contest took place in the beginning of November. It has been over six months since the winners were announced. When did previous prime ministers meet the contest winners? 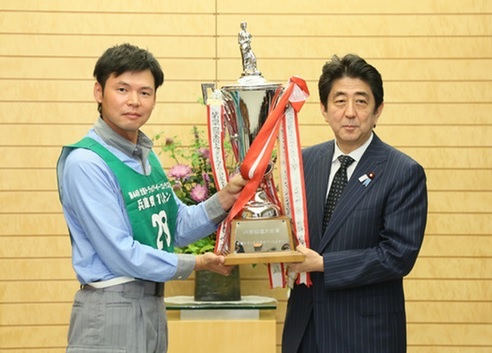 Koizumi Jun'ichiro met the contest winners more than once, and each time within weeks of the contest. At least from the evidence in the Kantei's photo pages, Prime Minister Abe is not alone among his predecessors in not letting the trucking association bask in his glow. Prime ministers Kan and Fukuda did not receive the truckers at all (though a meeting may have been in Kan's calendar for March 2011 -- who knows?). When prime ministers have hosted the truck driving contest winners, however, they have done so in a timely fashion -- not six months after the fact. What can be read from this tardy reception? The pragmatists might say that Abe has been so preoccupied with the revival of the animal spirits of Japan's economy that he could not find the time to meet the truckers before now. The strategist might say that the truckers have never been an important constituency for Abe. He has met them but only as a gesture on behalf of his party a month before the House of Councillors election. The cynic might say that Abe's meeting the winners six month's late is an example of a profound lassitude, another instance of an item getting pushed down the domestic political calendar, like the startling delay until May 15 of the passage of the national budget. One should perhaps be cynical. When one checks the legislation the Abe Cabinet has managed to push through the Diet, bearing in mind that the ruling coalition has a supermajority in the House of Representatives, one should probably come away unimpressed. Grist for the mills of those who believe in a substantive difference between the parties. Later - I have to be careful. Any more of this kind of archeology of the banal -- following the threads leading out of the apparently trivial, arriving at all kinds of unexpected destinations -- and I will drive away all of my readers. NOW I get it - all that complaining (from truckers, presumably) in the days when kosoku was 1,000 yen on weekends that the roads would be clogged with Sunday drivers was because they think they "own" the roads. News flash: we pay taxes, some of which presumably go to roads (if not the tokubetsu kaikei gravy pot, AND kosoku users pay through the nose for tolls too. Too bad that ended - it was a great way to spread some money outside urban areas. I recall that PAs were jammed and had personnel to direct parking lot traffic. Taking The "Flight" Out Of "Test Flight"